March 8, 2017, is International Women’s Day, as well as #DayWithoutAWoman, the latter commissioned by the same team that inspired us to walk in the Women’s March. 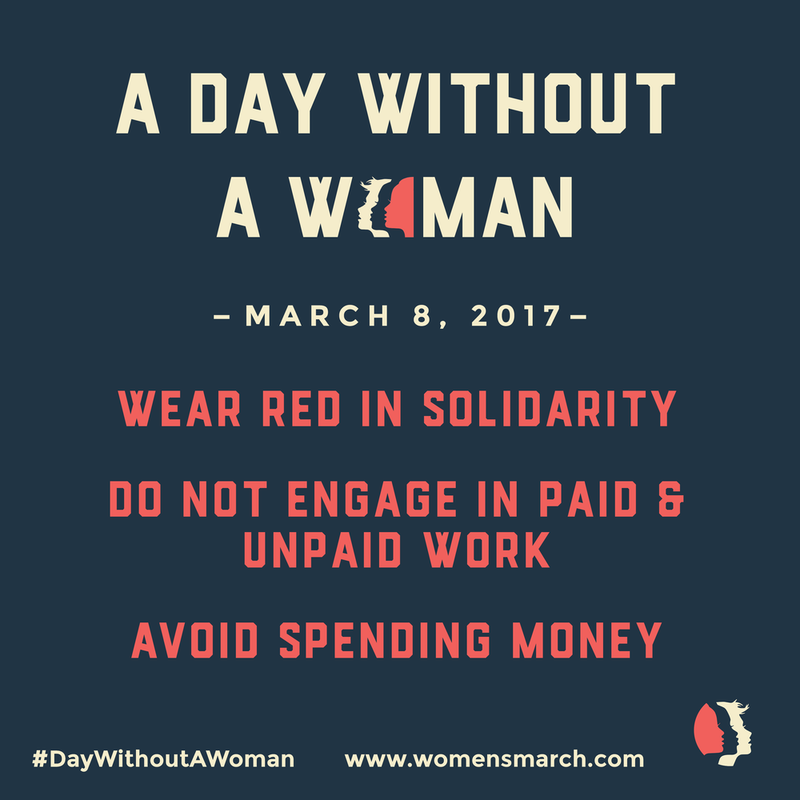 For #DayWithoutAWoman, there are a few ways to go about supporting the 24 hours in which there is an acknowledgment of the physical, mental, and emotional labor women of all cultures and ages go through in a still, patriarchal system. Similar to the #DayWithoutLatinos and the bodega boycott in New York City, where local convenience shop owners closed in protest of Trump’s Muslim ban/Immigration ban. For the third suggestion, if you do spend money, try to buy from women-owned businesses! On Angie Martinez‘s Power 105 radio show, she invited guest Linda Sarsour, co-chair of the Women’s March to discuss the list above. Soundbites include clarifying that if you’re a stay-at-home mom, have your husband or boyfriend pick up the laundry or make dinner for a change. For them and because it’s your day off, this is what it’d be like if you weren’t around or able. It was also just announced on Tuesday, March 7 that Nike would release Hijab gear for those of Islam faith to wear and who are also athletic. Household fashion labels are really stepping up in making inclusivity the way of the future. The announcement comes on the heels of Nike just unleashing their Equality campaign, featuring famous faces like Serena Williams and Gina Rodriguez on why integration and a fair shot for everyone to achieve their dreams are game both off and on the court, football, the silver screen, and in the arts. There’s a lot to be angry about in the world that is 2017. But there’s additionally a lot of good still left to be celebrated and made. The Women’s March initiative and the brands and countless individuals that are supportive are emblems of keeping the faith. Let’s commemorate International Women’s Day and #DayWithoutAWoman with these jams exalting girl power to its 100th degree. Ladies, you’ve earned it. Now go get ’em.